Value Added Tax is a hideously complex and onerous tax regime imposed on businesses in the UK. It is an indirect tax charged on taxable supplies of goods and services made in the UK by VAT registered businesses. UK VAT registered businesses pay VAT on supplies of goods and services and claim credit for VAT paid to other businesses for goods and services purchased. The net difference of VAT tax is either payable to HMRC or claimable from HMRC as reflected in a VAT return usually filed on a quarterly basis. UK VAT laws require you to file periodic vat returns with HMRC. VAT returns are prepared from sales and purchases made during a particular period. Included in a typical vat return are UK sales and purchases, acquisitions from and sales to other EU countries and reverse charge if any. VAT returns in the UK are filed online and we could compute your vat liability, prepare the VAT return and file it online for you as your VAT agent in the UK. VAT registration is compulsory for all businesses selling ‘taxable’ goods and services in the UK and if their total turnover exceeds certain threshold. 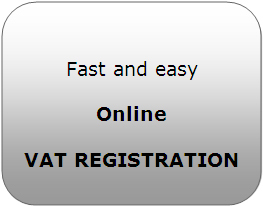 Please see our VAT registration for the interpretation of the law as well as for quick and online vat registration. There are three ways in which VAT can be accounted for: Cash Accounting, Flat Rate Scheme and Annual Accounting Scheme. See more details on the Flat Rate Scheme. Under cash accounting, businesses, with an expected taxable turnover in the next 12 months of not more than £1,350,000, account for VAT tax only on a ‘payment and receipt’ basis. VAT is accounted for only on invoices paid and received. This is suitable where it takes longer to collect invoices and where bad debt levels are relatively higher. Annual Accounting Scheme is open to businesses with an expected taxable turnover not exceeding £1,350,000 in the next 12 months. Agreed payments based on previous year turnover are regularly made and a single annual return is filed at the year end. As the choice of a particular accounting scheme depends on a variety of factors it is best to seek professional advice before deciding which one suits a particular business situation.